All Sutter homes currently listed for sale in Sutter as of 04/18/2019 are shown below. You can change the search criteria at any time by pressing the 'Change Search' button below. "1828 Walnut is an immaculate home located in a quiet end of road location w/no traffic! Appealing front manicured low maintenance yard. This beautiful home features 3bd sba 1132 sqft, 2 car garage, .25ac lot & new roof, plus 2 story playhouse/guesthouse w/concrete floor, insulated & full electrical. The garage has been finished as gameroom/man cave or shop. This home is perfect for the growing family. Nice open room concept, fully furnished kitchen w/newer stainless steel appliances, gas stove, built-in microwave & dishwasher, tile counters, custom cabinetry & breakfast nook. File floors in kitchen & bathrooms. Enjoy the nice size bedrooms; 2nd bedroom has walk-in closet. The huge backyard was designed for entertaining w/a covered concrete patio, private lattice fenced area for hot tub or sunbathing, large custom firepit, professional horse shoe pits w/sandbox covers & river rock landscaping. Do you have a green thumb? You'll be busy with the garden & fruit trees including grapefruit, mandarin, orange, apricot, apple, cherry, lemon, pomegranate, peach, almond, pear & tangerine! The garden has 2 above ground raised beds & in-ground compost box. Wine grapes (2 varieties) on trellis. Small detached shop/w concrete floor, roll-up door & insulated with/electrical, RV or trailer parking. 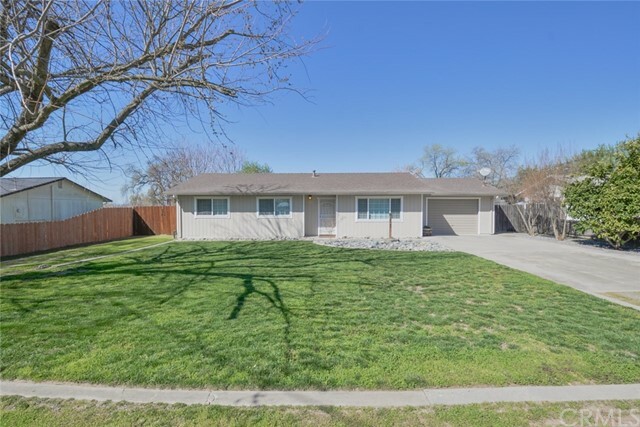 This great family neighborhood offers access to Sutter Buttes bike trail & walking distance to schools & shopping. Don't miss out on this move-in ready home! Schedule your private tour today..."